at the location of the Bridge Creek/Moore tornado. Although tornadoes of varying intensities, shapes and sizes, are a common enough occurrence in or around the famous "Tornado Alley", the Oklahoma May 3, 1999 tornado outbreak has to about the most devastating tornado outbreak in recorded tornado history. 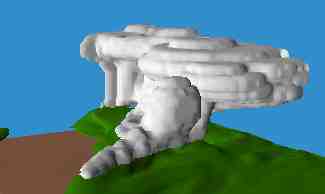 The May 3rd tornado outbreak was, in fact, a series of tornadoes with as many as 76 tornadoes touching down in the Oklahoma region on May 3rd, 1999. The outbreak caused the deaths of at least 47 people* and left approximately 900 people injured. Forty-two of the deaths occurred in Oklahoma, and five in Kansas and the material/financial damage was into the 1.2 Billion US dollars range, more than the previous most devastating F5 tornado recorded in Wichita falls, 1979, which killed 42. *NB. Although the death toll was 47 lives lost the toll was 'relatively' low, when the total damage and destruction of the outbreaks is taken into account. This 'relatively' low death toll is thanks to persistent warnings and bulletins of the US National Weather Service (N.W.S.). At its peak, the tornado outbreak was estimated at ± 1000 miles in diameter (see satellite image above) with winds gusting up to 380 mph and reports of hailstones as large as 4.5 inches in diameter recorded in parts of Texas and Oklahoma and generated explosive convective activity (thunderstorms). Fact: Tornado outbreaks of this magnitude are not unusual, occurring approximately every five years. 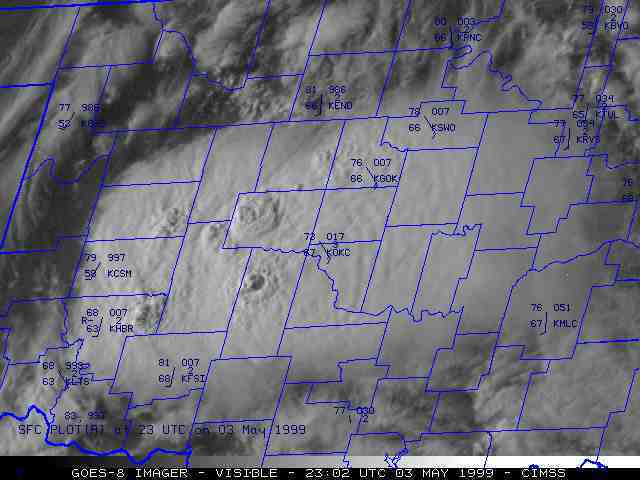 What is unusual about the May 3, 1999 tornado outbreak in the Central Plains was that F4 and F5 tornadoes hit a highly populated area. Large cities occupy a very small percentage of total land area in the United States, and the two percent of all tornadoes in the U.S. that are F4's and F5's generally occur in rural areas. Fact: There is no link between La Niña or El Niño and these Oklahoma tornadoes! 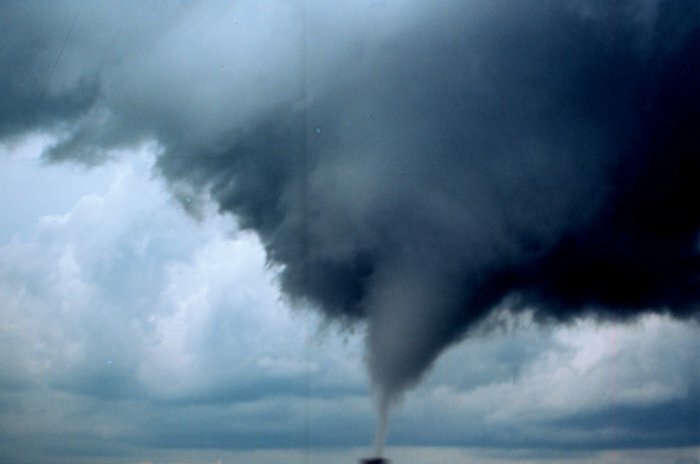 Tornadoes happen every year regardless of La Niña or El Niño. "The best studies conducted to date show tenuous evidence for a link between tornadoes and the phase of El Niño. "None of the statistical comparisons that we presented allow us to differentiate tornado activity as a function of the El Niño-Southern Oscillation phase." (Schaefer and Tatom 1998, 19th Conference on Severe Local Storms)". *NB. 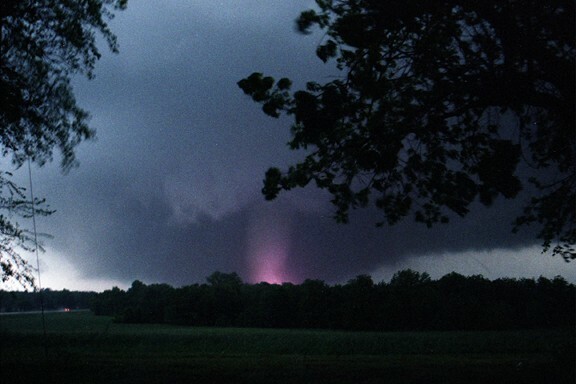 The picture shows an occluded, or composite, mesocyclone tornado rated an F3 by an N.W.S. damage survey. Occluded means old circulation on a storm; this tornado was forming while the new circulation was beginning to form the tornadoes which preceded the F5 Oklahoma City tornado. Facts courtesy of Dr David M Schultz and the National Severe Storms Laboratory and the NOAA Profiler Network. Joplin, Missouri 2011. This page about the May 3, 1999 Oklahoma tornadoes was first written in 2004 and served as subject reference until the catastrophic EF5 tornado that hit Joplin, Missouri May 22, 2011. Facts vary according to the sources but on average during the Joplin tornado some 160 people died, more than a 1000 people were injured, approximately 2-3000 homes were destroyed and an estimated number of (±)550 businesses were said to have been damaged. The overall financial loss caused by the Joplin tornado is evaluated to be around $3 billion, making the Joplin tornado, and according to the NOAA report, the deadliest tornado since records began in 1950 and the most expensive ever. It certainly merits more than a Post Scriptum to cover all the facts and details so a trip to the corresponding NOAA and US Tornadoes dotcom sites is well worth the detour.